The Eau Claire Chain of Lakes is made up of 11 connected spring fed, clear water lakes, surrounded by an abundant forest of large pine and hardwood trees. (Click on any picture for a better look.) These lakes make up the headwaters of the Eau Claire River, which flows into the St. Croix River at Gordon, WI. The three larger lakes, Upper Eau Claire, Middle Eau Claire and the Lower Eau Claire, act as the focal point, with 8 smaller spring fed lakes, linked and feeding into them. The largest lake of the chain with a surface area of nearly 1000 acres, 10 miles of shoreline and a maximum depth of 90 ft. Six satellite lakes (Robinson, Birch, Sweet, Shunenberg, Smith and Devils) complete its network. Public boat ramps are available. This is the second largest of the chain with a surface area of approximately 900 acres, 11 miles of shoreline and a maximum depth of 60 ft. One satellite lake (Bony) completes its network. A public boat ramp is available. This lake is the last one in the chain with a surface area of about 800 acres, almost 8 miles of shoreline and a maximum depth of 40 ft. It has one satellite lake (Cranberry) to complete its network. A public boat ramp is available. Nestled around the Eau Claire Chain is an array of other lakes, each with their own personality. Included in this array are Murray, Sandbar, Tomahawk, George, Priest, Little Island, Ellison, Catherine, Pickerel, Mimi and Henderson. 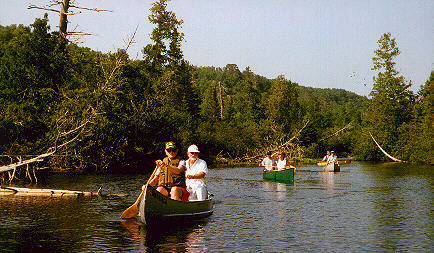 Pickerel and Tomahawk Lakes have public boat landings. Fishing is excellent in the spring and the fall. The lakes support a good population of game fish. Included are Muskellunge, Northern and Walleye Pike, Small and Largemouth Bass, with Crappies, Bluegills, Sunfish, and Perch rounding out the species. Good trout fishing can be enjoyed in area rivers and streams. These lakes situated in southwest Bayfield and southeast Douglas Counties are nestled in a heavy forest of large jack, white and Norway spruce and balsam pine and areas of mixed hardwoods. This makes for excellent and peaceful walks and drives though the countryside, while viewing the abundant wild life of deer, bear, fox, wolves, bald eagles, loons, ducks, and smaller birds and animals of all kinds. The fall colors reach their peak in late September and early October produce serene beauty. Winter brings new sights and sounds. 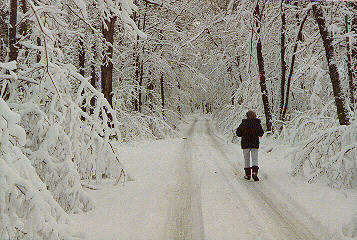 The pine branches heavy with new fallen snow makes for excellent snowmobiling, cross-country skiing and snowshoeing. Be sure to bring your cameras for keepsake memories. For more information please contact the business of your choice.